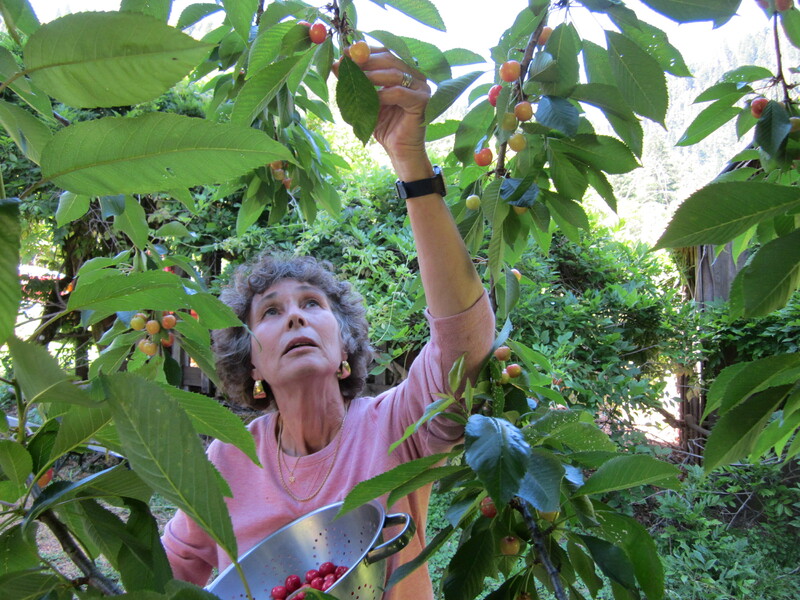 Picking luscious Queen Ann cherries in California. I’m a real desert rat, but when the temperatures get into the double digits regularly, I get a yen to check out other ecosystems. This year my husband and I visited our friends Mal and Susan Terrence who live in Humbolt County near the Salmon River in far northern California. What a pleasure to be in a place that has an abundance of water for gardening and household use. I went crazy picking cherries, rhubarb, pea pods, raspberries, greens and big flower bouquets from Sue’s garden. 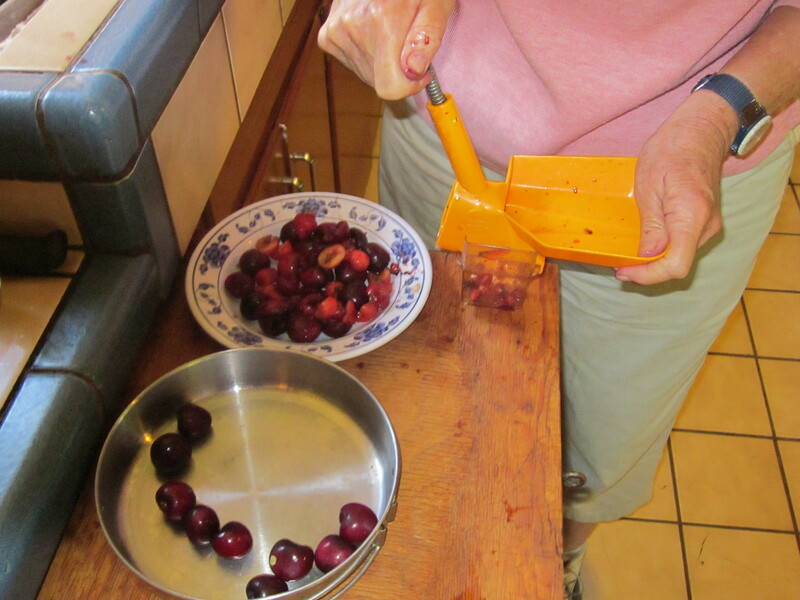 Cherries have pits that must be removed if you are going to cook with them, and there are several clever devices for cutting them out. Here’s a simple plastic device that stamps out the pits and collects them in a little plastic bin. The cherry rolls out into your pan. It isn’t 100 percent accurate so you need to check each cherry. 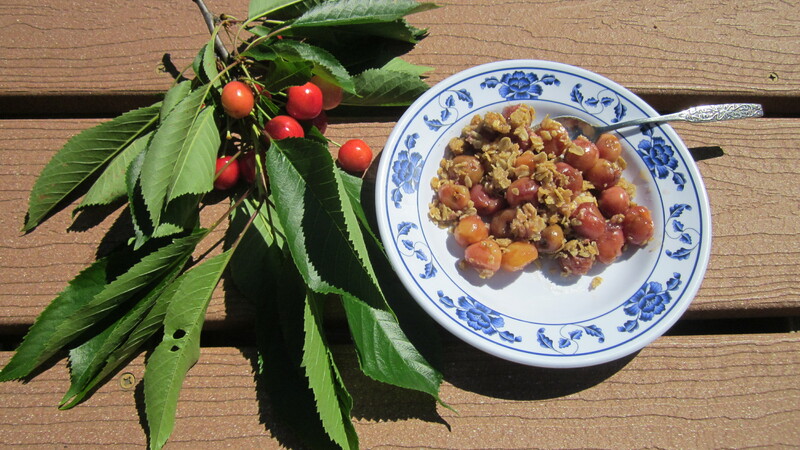 We mixed the pitted cherries with a little sugar and made a topping from oatmeal, butter, brown sugar and a little flour. 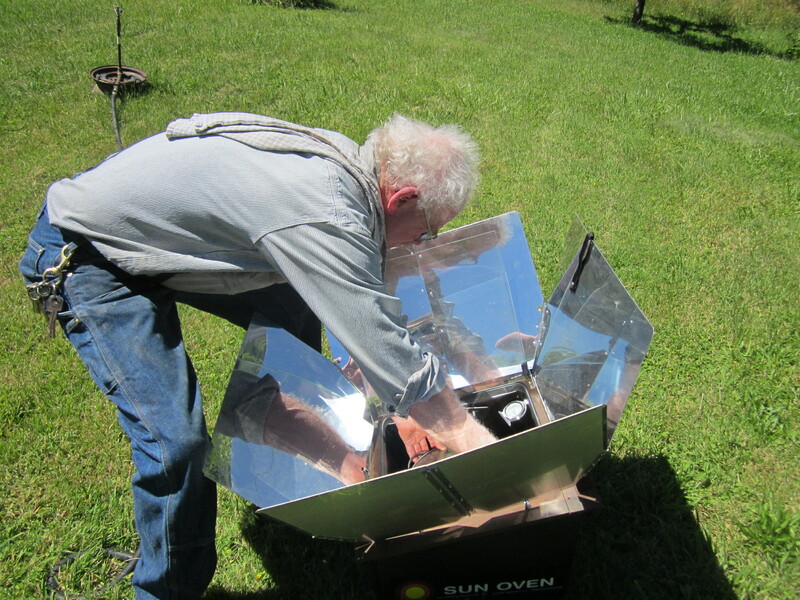 Then we put it in the solar oven. Positioning cherry crisp in the solar oven. Here’s a picture of the result. It gotten eaten so fast that I didn’t get a photo of the whole dish. I rescued this last piece for a picture. Last serving of the delicious cherry crisp. I’ve been harvesting jojoba beans here in the Sonoran desert. These are such a contrast with the juicy red cherries! The very idea of fresh cherries coming off the tree and into a pie — what could be better?